BORDERING ON CAMEO! The obverse sports CAMEO+ devices! The reverse is SO close to cameo with moderate frosted cameo devices. Pristine spot-free, haze-free jet-black mirrored fields. NGC has graded 519 examples in PF 67 but there are only 27 certified in PF 67 STAR. 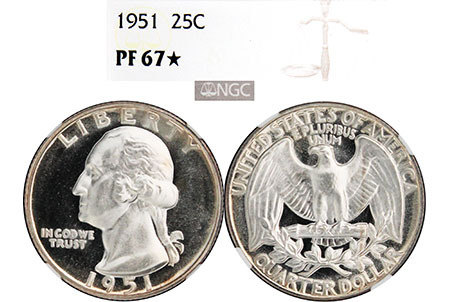 Finding a 1951 proof Washington in STAR in ANY grade is extremely rare. NGC has graded a total of 1,766 examples in ALL grades of Proof and only 55 have earned NGC's strict STAR designation.